Bernie Challis at Van der Vliet Yachts tells me there's a €225,000 price cut on Wizard, a 30.3m Porsius-built motor yacht. Built in 1985 to a design by De Vries Lentsch, she’s had several refits, most recently in 2012 when she was lengthened with the addition of a swim platform. Accommodation is for up to nine guests in a master suite, VIP stateroom and a double and twin cabin. Twin 550hp Mercedes engines give her a range of 2,000 nautical miles at her cruising speed of 10.5 knots. 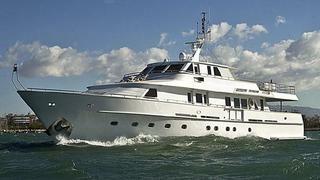 Wizard is down from €1,975,000, VAT inclusive, to €1,750,000.